Underground Cell Key - / 1 - / - Research Hall Underground Cells Key to the cell below the Grand Cathedral. decay quietly in the fallow darkness. 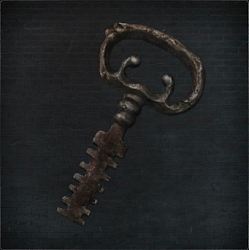 This key will unlock the majority of the cells in the Underground Cell area towards the end of the Hunter's Nightmare, with the only exception being the Inner Chamber Cell. By opening those cells you'll be able to take on a fearsome Hunter and claim the Church Pick weapon from him, as well as free the tormented, Yamamura the Wanderer to get his Attire set. To acquire it you will need to make your way up to the Rafters of the Research Hall and activate the mechanism there to raise the staircases. 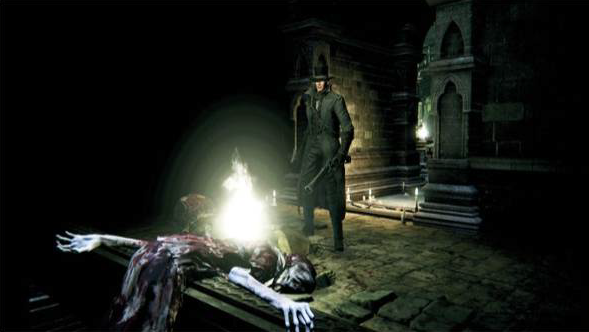 Only then will you be able to reach Floor 3 - West Side, where the key resides. Treasure in (Main Game): Research Hall, once you use the Eye Pendant to take the lift. Progress to the top of the tower and use device which raises it. And then from the lamp at the bottom, if you take the hidden path to the right on the second lift you can jump midway. Follow the path to the left, head down and then up the stairs and it will be in a little room at the far side. You can bypass proceeding further into Research Hall and access Underground Cell Key early, by jumping from dark Patient Room 2F on to platform with the key, as seen in this video.